In this section we show how to record high quality signal data for your maps i.e. create good quality fingerprints. Note that to achieve great positioning performance, it’s crucial to learn to record accurate paths. This is the main data collection phase. 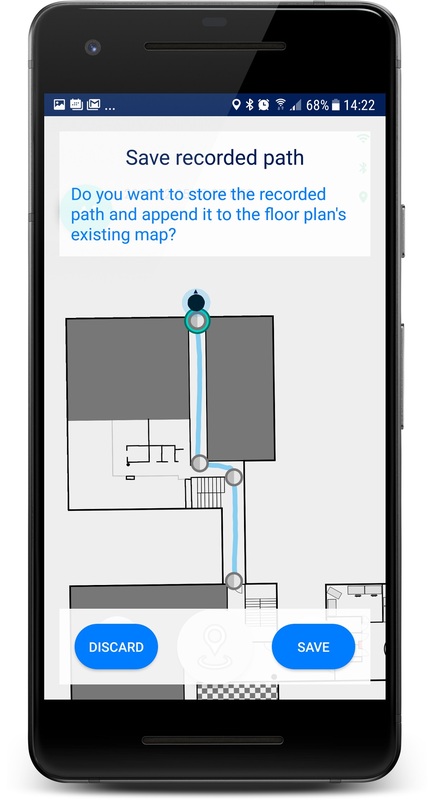 The recorded paths are used to generate the signal maps that enable indoor positioning. 1. Plan the path you are going to record. 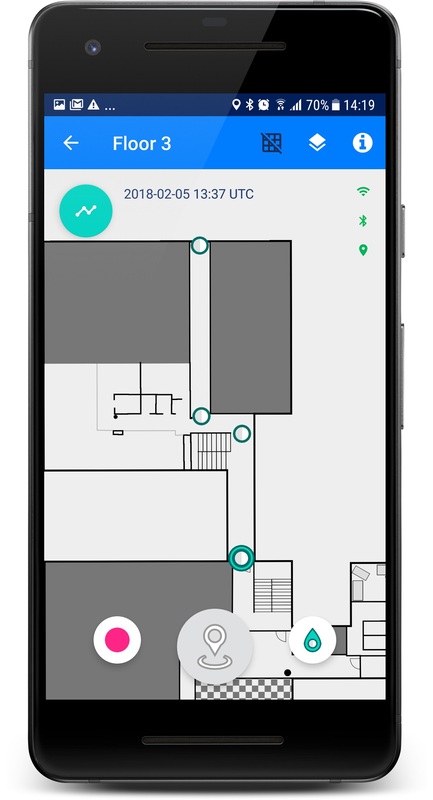 Add waypoints about every 5-10m on the path. Use the guidelines in adding waypoints. 2. Walk to the starting waypoint of your planned path. Zoom close enough to see the exact spot. Choose your starting waypoint by tapping it. 3. 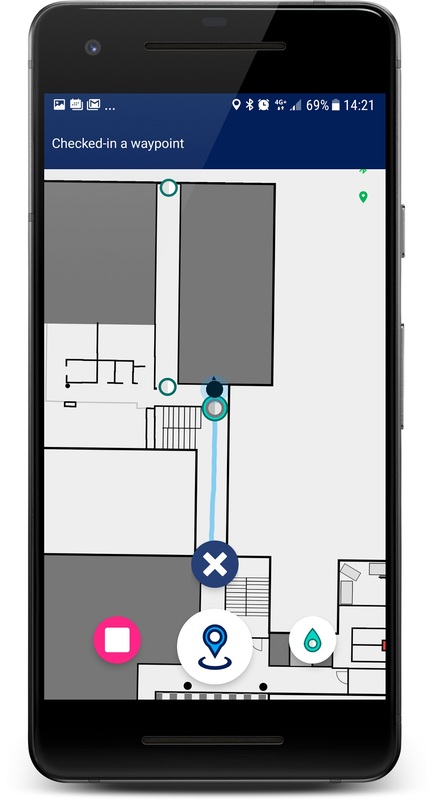 Start recording path by tapping the red record button. 4. 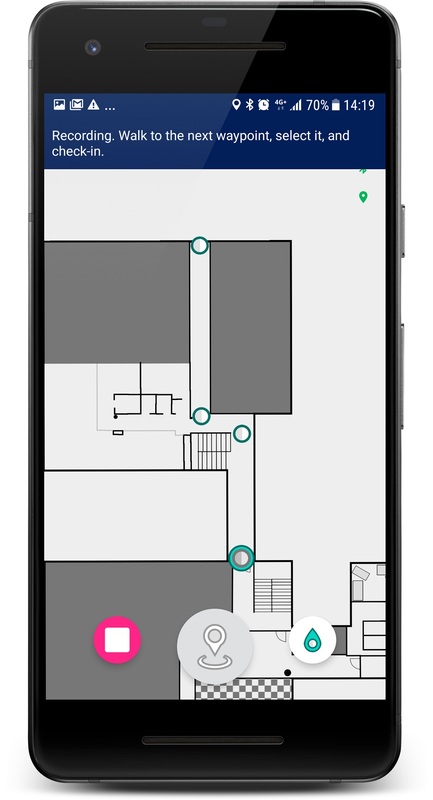 Start walking and select the first waypoint by tapping while you’re approaching it. Note that before the first check in your route won’t be drawn in the map. 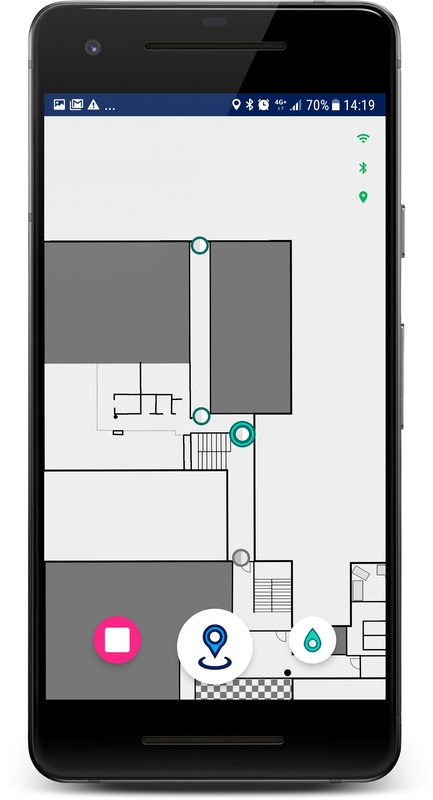 Keep the tip of your phone pointing to the direction you walk. Keep your phone orientation stable while walking – keeping the hand holding the phone close to your body helps. 5. When you arrive at the first waypoint, check in by tapping the button in the middle. An estimation of your walked path is shown. Note that you don’t need to stop at the waypoint to check-in, you can just continue walking and check-in “on the fly” – just remember to be accurate! 6. Continue through your planned walk path and check in to the waypoints. 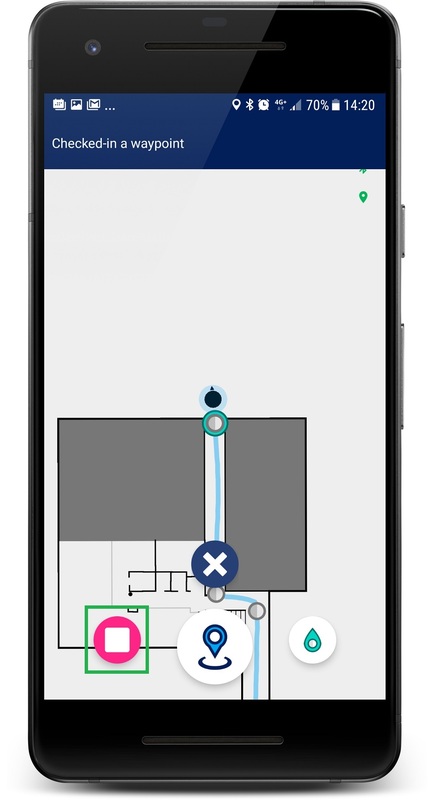 MapCreator will try to follow your path to automatically select the next waypoint. If the automatic selection is wrong, select the correct waypoint by tapping it. Touch the button in the middle to check-in. 7. After last check-in along your planned path, tap the stop button. 8. Choose Save. If the path looks wrong (not the route you walked), choose Discard. If a warning is shown, choose Discard. When mapping, try to walk naturally in order to keep your walking speed constant. Keep your phone pointed towards the direction of movement with the screen upwards. If something or somebody comes in the way of your path, pause walking and wait for the path clear and continue walking again. Try to avoid any excessive movements and don’t shake the phone. When you make a turn during mapping make sure that the phone turns with you. You can check into a waypoint several times during the same recording. You don’t need to stop when checking in to a waypoint. Try to keep the length of the recordings to maximum of 5 minutes but to a minimum of 1 minute. Shorter paths are easier to repeat in case of any mistakes on the way. Make your mapping an iterative effort instead of one long path trying to cover all of the area.